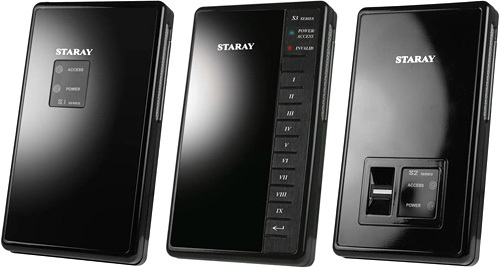 STARAY Drive Enclosures Provide 3 Different Methods Of Data Protection | OhGizmo! By Andrew Liszewski on 04/07/08 • Leave a comment! If you’re carrying around launch codes, CIA dossiers or even a script for the funniest screwball comedy of all time, you’re probably in the market for some level of data encryption. Might I suggest the STARAY S-Series drive enclosures from RAIDON, which come in 3 varieties catering to all levels of paranoia. All of the enclosures allow you to setup both public and encrypted partitions on the drive, so you don’t necessarily have to deal with the security measures for files you’re not worried about. However for the data you want protected, the S1 Series uses a software password that has to be entered on the computer once the drive has been connected. The S2 Series steps things up with a fingerprint scanner that requires you to swipe, before you can access the encrypted data. Finally, the S3 Series has a keypad running down the side that requires you to punch in a code to unlock your data. I’m not sure if the use of Roman Numerals on the buttons is the best approach, particularly if you failed that section in grade school. But you can always write over them with a Sharpie. That looks professional right?